Nonl inear ideas of a "sol iton" variety have been a unifying influence on the na tura 1 sci ences for many decades. HO~/ever, thei r uni versa 1 a pprec i at i on in the physics community as a genuine paradigm is very much a current develop- ment. All of us who have been associated with this recent wave of enthusiasm were impressed with the variety of applications, their inevitability once the mental contraint of linear normal modes is removed, and above all by the common mathematical structures underpinning applications with quite different (and often novel) physical manifestations. 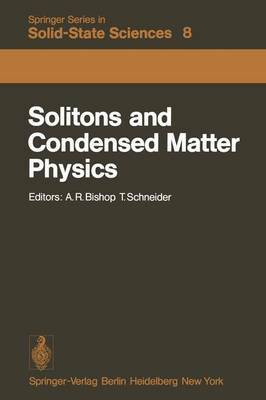 This has certainly been the situ- ation in condensed matter, and when, during the Paris Lattice Dynamics Con- ference (September 1977), one of us (T. S. ) first suggested a condensed matter soliton Meeting, the idea was strongly encouraged. It would provide an opportunity to exhibit the common mathematical problems, illuminate the new contexts, and thereby focus the "subject" of nonlinear physics at this embryonic stage of its evolution. The original conception was to achieve a balance of mathematicians and phy~cis~ such that each would benefit from the other's expertise and out- look. In contrast to many soliton Meetings, hO~/ever, a deliberate attempt was made to emphasize physics contexts rather than mathematical details.